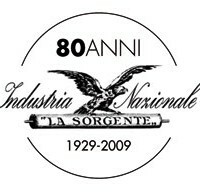 The “Società Anonima Industria Nazionale La Sorgente”, a manufacturing company of printing ink, was founded in Stia (Arezzo), on 25 May 1929, even if there are previous cooperative forms and different geographical places, establishing its beginning in 1919. Wide and gratifying evidence is a Memorandum of Association in Milan, on 22 January 1926, and awards, granted in various shows. This trademark is evidence of our birth, our roots, our story. It tells about the dreams, energies, passion and firmness distinguishing our work. They brought us to be what we are today, one of the most important Italian companies for the supply of ink for flexographic printing. After the first 80 years, we are still willing to grow up and face new challenges to be more and more a real point of reference for all those printers who are looking for timeliness, flexibility, reliability and want to improve their performances continuously.